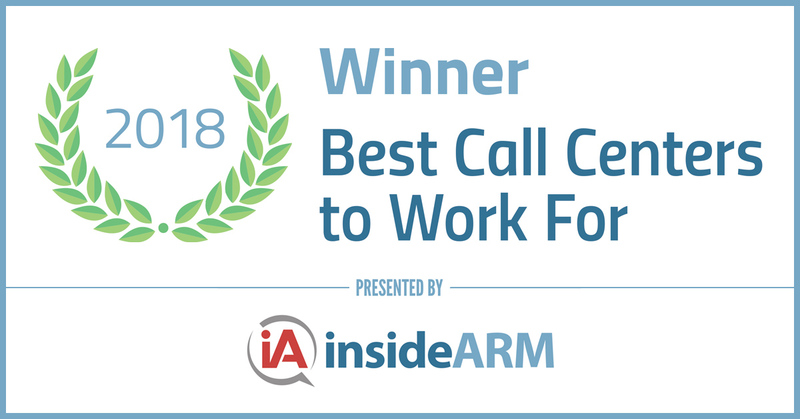 Professional Finance Company (PFC) has been honored by insideARM as the nation’s 2018 Best Call Center to Work For (previously known as the Best Places to Work in Collections). This marks the seventh time since 2008 and the fourth consecutive year PFC has earned recognition as one of the best places to work in the accounts receivable management industry. 2018 is the first year PFC has been ranked #1 in the Large Companies Category (150+ employees). insideARM is the nation’s leading news and information provider for the Accounts Receivable Management industry. The Best Call Centers to Work For program celebrates and recognizes excellence among work environments in customer service, collections, and outsourcing. Companies from across the U.S. entered the rigorous two-part survey process to determine the Best Call Centers to Work For. The first part consisted of evaluating each nominated company’s workplace policies, practices, philosophy, systems and demographics. The second part consisted of an employee survey to measure the employee experience. The combined scores determined the top companies and the final ranking. Founded in 1904, PFC is a full-service accounts receivables management company based in Greeley, CO. PFC serves a national client base in a wide variety of industries, including healthcare, government, utilities and other credit-grantors. PFC’s slogan is “working together to resolve debt,” which it accomplishes through an unwavering commitment to its core values of integrity, accountability and professionalism.